"An extremely well put-together little droid." Joining the Star Wars collectible Heroes articulated figure collection, Sideshow Collectibles is proud to present the R2-D2 Deluxe Sixth Scale Figure. 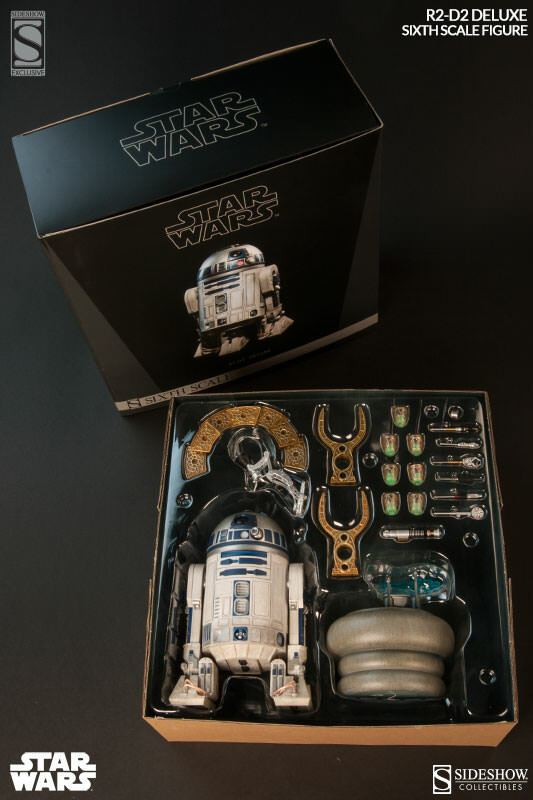 Everyone's favorite droid from the galaxy far, far away is ready for adventure with intricate articulation and fantastic detailing. 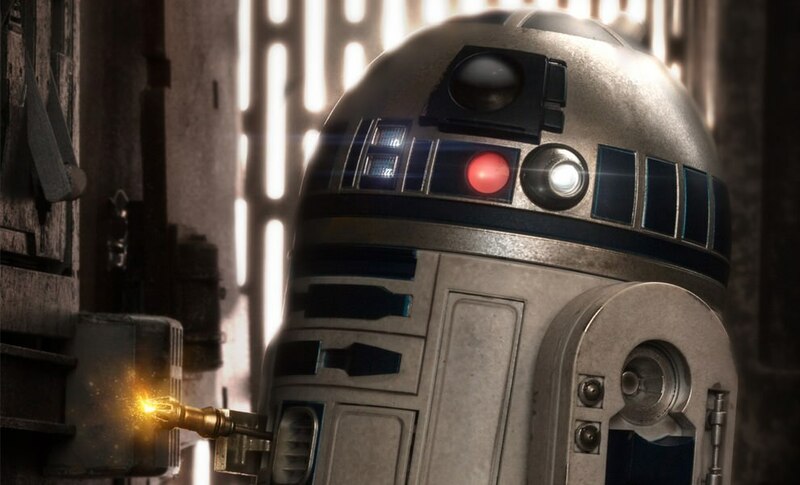 The feisty blue and white astromech rolls right off the big screen, with sequencing lights and a swiveling dome that features various moveable ports and hinged panels. Prepared to assist the Rebel Alliance, it’s full speed ahead for the starship mechanic, with rolling treads and a retractable third leg enabling tripedal travel. 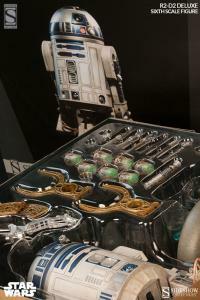 Additionally, Artoo features a hidden Skywalker lightsaber hilt with a magnetic tip that allows access to a range of his internal gadgetry, including periscope, life-scanner, and multiple articulated arms for performing various intergalactic duties. Recreate all of your favorite movie moments with special bonus accessories, including Ben Kenobi's round table, Leia’s secret holographic transmission, and a multi-tiered beverage tray for R2’s one-time server gig on Jabba the Hutt’s luxury sail barge! 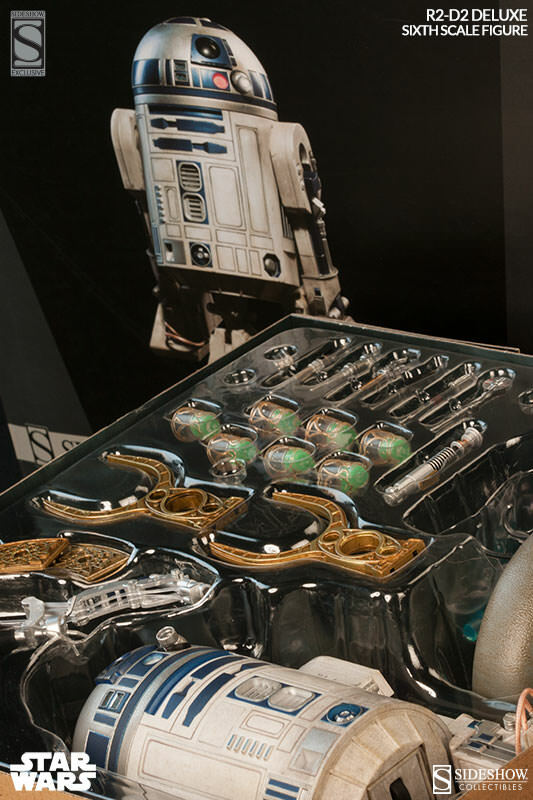 Watch more on the R2-D2 Deluxe Sixth Scale Figure! I bought this figure pack when it first came out and I couldn't be happier. I love him so much and Thank You Sideshow for TONS of extras. very well done figure. 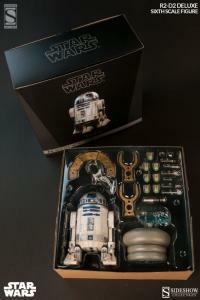 Not only was R2 a great figure, id like to brag on SS amazing customer service. My R2 had a scratch and paint issues on the dome and they sent me a replacement. These things make me a loyal customer for life. I absolutely LOVE this figure, it blows the Hot Toys version away. The attention to detail is off the chart. Very screen accurate and a good value for 149. I would rate this a 9.75 out of 10 & the only reason it is perfect is the fit of the panels that open for accessories doesn't always fit right. Definitely one of my most anticipated figures from the Star Wars line. The attention to detail is fantastic and superb. The wait is worth it. Thanks. My R2 unit arrived in hardly no time. 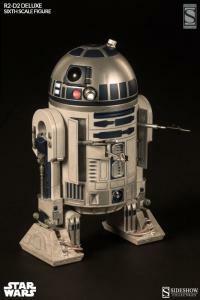 Once unpacked I stood it right next a R2 model that I built some 30 odd years ago. This one is much more detailed and sophisticated but that was expected as well. 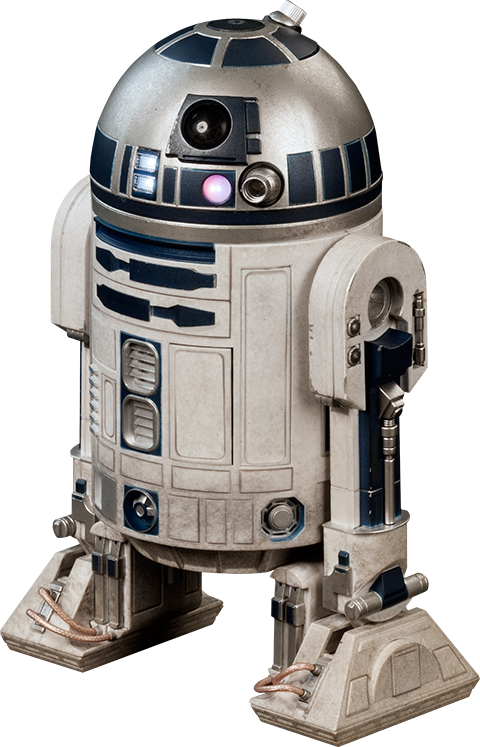 I'm thrilled that I got one of these exclusive R2 units. Thanks.